Our weekly dance program is run by Little Groovers, a fabulous dance company focused on dancing for the younger ages. 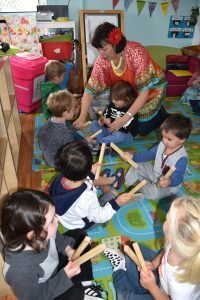 These half hour sessions have been specifically developed to promote musical appreciation, rhythm, co-ordination, fitness, body awareness, social skills and most of all fun. Children learn basic dance disciplined behaviours such as waiting, taking turns, following instructions, working together and having a positive attitude. Through the use of a variety of props and music the children are taken each week on an exciting and imaginative journey in to the wonderful world of dance. 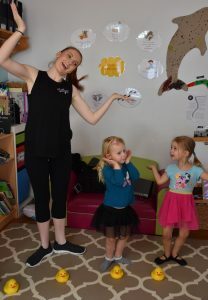 Our dance program is offered to our Seahorses, Dolphins and Sharks at no additional cost to families. 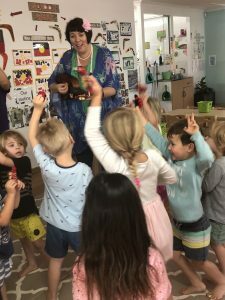 Each week all of our children and educators have the pleasure of learning through music, when multi award winning singer and musician Lil’ Fi visits the centre and shares with us her passion and knowledge of music. 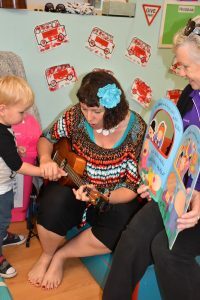 Lil’ Fi has produced over 8 albums and has had many years’ experience providing high quality music education for young children. 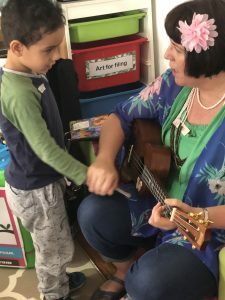 With the help of her ukulele and other musical instruments and props Lil Fi makes learning fun! Music and movement is a wonderful way to nurture and support children’s holistic development. It not only stimulates the brain but also fosters language skills, literacy, numeracy, and self-confidence. Our music program is offered to all age groups at no additional cost to families. At Kids on 4th we are very pleased to offer our fantastic sports skills program. This program is offered to all of our children over 2 years and is provided at no extra cost to families. Our sports skills classes are held every Monday and Tuesday for all Seahorses, Dolphins and Sharks. They are 30 minutes in duration and are run separately for each room. The classes are run by KDV Mini Sports – offering a FUNdamental motor skills program where children are taken on a fun new adventure each week. KDV are passionate about fostering children’s love of sport and promoting a healthy lifestyle from a very young age. The KDV program is non-competitive, fun, play and curriculum based and suitable for both boys and girls. It provides a fantastic framework for children to learn sports skills in an inclusive environment, whatever your child’s ability. We love our families to also learn from this program. 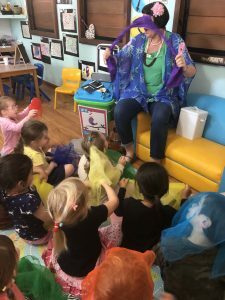 You are very welcome to come along to your child’s session anytime.